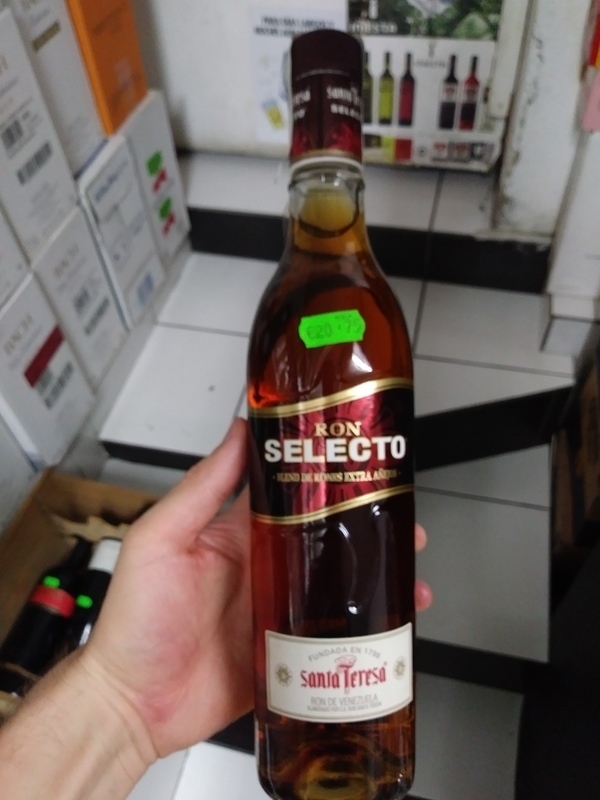 Have you found an online vendor selling Santa Teresa Selecto? I got this on sale for $16, regular price was around $30 - it is in a plain glass bottle not the fancy one shown here. Nicely balanced, not overly sweet but lots of robust flavors to be had here. Tobacco, leather, smoke, with a nice woody finish that goes on for a while. Not sure where I picked this one up, but the bottle reminds me of something out of the 1970s (and I know I did not have it that long). Enjoyed the rum's oaky flavor both over ice and mixed. Debo decir es un ron agradable, con golpe alcohólico y sabor dulce, un poco aromático también. Sin embargo no es un ron selecto como reza el nombre, para mi es un ron ligero y medianamente recomendable. Tried the Santa Teresa Selecto on a rainy day back-to-back with Oliver and Oliver 1985 Exquisito and I had to downgrade it from 9 to 8. The Selecto earns a strong 7. Its smoother than the much more easily available Santa Teresa 1796. Selecto has a semi dark color, quite sweet flavor to the nose, very mellow flavor profile at taste and a mild burn at the end. Not that sweet, pretty well balanced but the body is not that full and getting a bit plainer. Aftertaste is decent. Real rum, a little oak, a sweet medium long finish. Nice rum. Para mí este ron es uno de los más rico que he tomado. Es muy dulce y combina bien con refresco. Sin duda comprare más botellas de este aunque este caro. a pleasant fruity rum,not to sweet,good with coke and ice. it's a nice rum but ist afterburn is a bit too fierce in my opinion . The Pampero anniversario is a better buy in all aspects. The Santa Teresa also lacks depth. It's a sweet but not too sweet ,fruity,spicy rum but pretty mediocre. Better than the average, but I would not drink it on the rocks. Not too sweet. Good for cocktails. Dieser Rum hat mir auf den Kanarischen Inseln so manchen Abend versüßt. I bought this bottle and expected to like it more than I did. It was one of the few rums I mixed because I was not a huge fan of the flavor profile it did not appeal to me neat but it is quite smooth. My favorite from Santa Teresa. Few places carry it. Tad sweet. A good rum and can be both sipped and used in cocktails.